Last week i received a ‘Friend Request’ from an UNKNOWN hot Girl and being Stupid i quickly added her. and guess what, this Girl turns out to be a Professional Spammer. After i added her the girl started messaging me frequently saying hi! hello! and i also started responding her casually. and then one day she messaged me saying, she wants to send me her private pictures and for this she needed my email address. the thing is she could have easily got my email from my profile but instead she wanted to make sure that i am active on that email ie she wanted my primary email. I have also seen some people commenting on her photos and scraping cell numbers and even their home addresses,.. people are crazy. You can read the full message below. 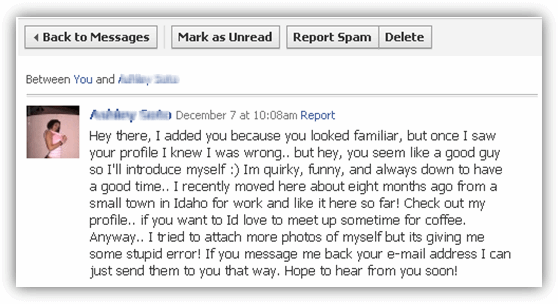 Ofcourse i didn’t respond her Back but if at all i had responded her with my email, lets see what would have happened. No doubt the Girl is doing this for her own Benefit.